2. Aponeurotic: Has to do with age-related weakness of the eyelid muscle. 3. Traumatic: Often it is seen that after suffering a blunt injury to the eyelid, the eyelid muscle which lifts up the lid, becomes weak and the eyelid droops down. 4. Myogenic: Muscle related problems like myasthenia gravis. 5. Neurogenic: Caused by damage to the nerves – commonly seen in third nerve palsy. Can there be medical causes or disease affecting the body that can cause eyelid drooping or ptosis? Yes, Myasthenia Gravis is one such disease that can cause drooping eyelids. It is a disease, which affects the junction of the nerves and muscles (neuromuscular end plate) and leads to muscle weakness. This is a condition that needs medical treatment and not surgery. Other causes can be chronic progressive external ophthalmoplegia and even strokes can cause nerve paralysis leading to ptosis. How do you treat drooping eyes? The treatment essentially depends on the cause. Congenital, traumatic and aponeurotic ptosis are usually treated with surgery. Surgical treatment of drooping eyelids is usually in the form of levator (the muscle that lifts the upper lid) surgeries. There are certain glasses that hold up the upper eyelid called ‘crutch glasses’. These may be prescribed in case the patient is not a good candidate for surgery. Are these commonly seen in children? Yes. Congenital ptosis is seen very commonly amongst children. 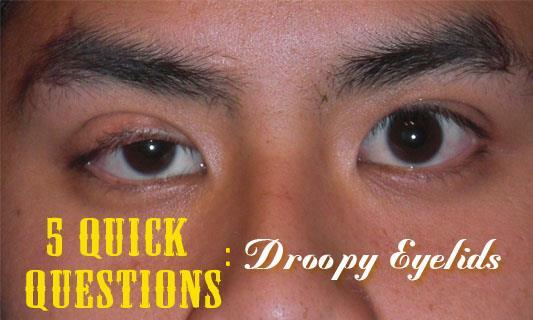 Droopy eyelids can affect one or both eyes and it may be mild, moderate or severe: The eyelid may droop only slightly, or it may droop so much as to cover the entire pupil (the hole in the coloured part of your eye). Ptosis or droopy eyes, if severe must be corrected at an early age in childhood to prevent the development of a lazy eye (Amblyopia). It can also lead to the development of a cylindrical refractive error (astigmatism), which need glasses to treat. Children under one year of age often undergo ptosis correction surgeries.